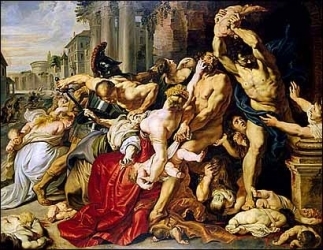 The children slaughtered by Herod the Great when he tried to kill the infant Christ. Born to the nobility, the only child of Count Gualtiero Nazarei and his wife Sibilla, from her youth Matthia preferred a simple life and rejected all the pomp of court life. When her father threatened her with an arranged marriage, she fled to the convent of Santa Maddalena at Metalica, Italy and became a Benedictine nun. Served as abbess of the house for 40 years. 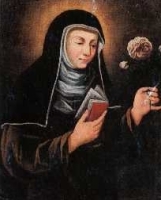 The convent later adopted the rule of the Poor Clares, and so Matthia is often listed as a Poor Clare. In 1758 the house was re-named Beata Matthias in her honour. Anthony's father died when the boy was eight years old, and he was raised for several years by Saint Severinus of Noricum. Severinus, however, died when the boy was in his early teens, and Antony moved in with his uncle, Bishop Constantius of Lorsch, Bavaria (in modern Germany. When he was of age, Anthony became a monk. Hermit in the area of Lake Como, Italy. He and some other solitaries gained such a reputation for sanctity that they attracted would-be students. Anthony, wanting to live the life of a hermit moved to the Isle of Lerins, France where he lived his last two years. Known as a miracle worker. Saint Ennodius of Pavia wrote a Life of Saint Antony. Greek Catholic. Ordained on 18 November 1893. Studied theology at Vienna, Austria from 1894 to 1899. Rector of the seminary in Lviv, Ukraine in 1902. Bishop of Stanislaviv (modern Ivano-Frankivsk), Ukraine on 6 May 1904. Arrested for his faith in 1939 by the NKVD. Arrested again in April 1945; deported to Kiev, Ukraine. Died in prison. Martyr. Member of the Premonstratensians. Canon of the monastery in Obermarchtal, Swabia (in modern Germany); spiritual student of Blessed Ulkirk. Abbot of the house in 1591. His dedication to the discipline and rule of the Order led to his appointment as visitor in the region, responsible for checking on other houses and helping their dedication. Late in life he received a vision of Blessed Ulkirk. Mercedarian. Master of Sacred Theology. Assigned in 1462 to ransom Christians enslaved by Muslims in Africa, the brought 184 of them home. Retired to live as a monk at the convent of Santa Maria in Toulouse, France where he devoted himself to prayer and contemplation. Brother of Blessed Herman of Heidelberg. Benedictine monk and priest at the monastery of Niederaltaich, Bavaria (modern Germany). 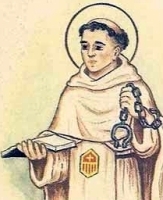 After his brother's death, Otto exercised his vocation from Herman's old cell. Caesarius led a dissolute and sinful life for years. Father of the Arian heretic Eudoxius. In the end, however, Caesarius became a serious Christian, stayed with the orthodox faith, and was martyred under Galerius Maximian. Less than 20 years old when she was arrested for aiding Christian prisoners during the persecutions of Marcus Aurelius. The judge offered her clemency in return for sexual favours; she declined. She was beaten, thrown to wild animals and executed for her faith. Martyr. Queen, the wife of King Tewdrig of Glamorgan, an area of modern Wales. The parish of Llangoven, Monmouthshire, and a chapel in Pembrokeshire are named for her. Teacher at Origen's school of theology in Alexandria, Egypt. Priest. Bishop of Alexandria in 282. A young man born to the nobility who publicly proclaimed his Christianity. Martyred in the persecutions of Decius. Fourth century priest in Rome, Italy. He collected old texts which were used by Saint Jerome. Both Saint Jerome and Saint Augustine wrote glowingly of Domnio and his ministry in Rome. Augustinian canon. Evangelized along the eastern shore of the Caspian sea in the 17th century. Martyred for loyalty to the Vatican. Converted by Saint Patrick. Ordained as priest and bishop by Patrick, and sent by him to evangelize the Isle of Man. Thirteenth-century monk and founder of the Simonos-Petras monastery on Mount Athos during the time of the Crusades. Poor Clare nun in Brixon, Italy. Three Christians murdered together in Africa for their faith. The only details to survive are their names - Castor, Rogatian and Victor. 20,000 Christians who were murdered during in 303 in Nicomedia, Bithynia (modern Izmit, Turkey) during the persecutions of Diocletian. Many of them were killed en masse when they were ordered, during Christmas Mass, to sacrifice to idols; when they refused, they were locked in the churches and the buildings burned around them. We know some details of a few of them, but most are known only to God. The names we have are - Agape, Anthimos, Domna, Domna, Dorotheus, Esmaragdus, Eugene, Euthymius, Glykerios, Gorgonius, Hilary, Indes, Mardonius, Mardonius, Maximus, Migdonius, Migdonus, Peter, Peter, Theophila, Theophilus and Zeno.